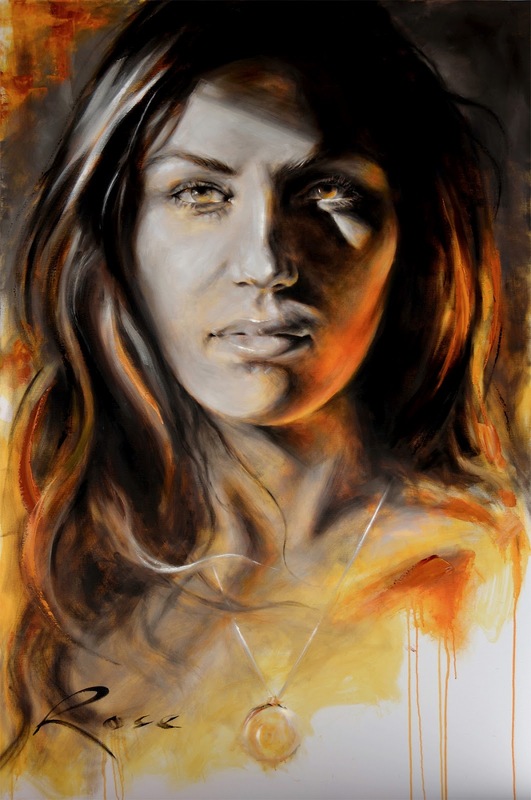 Look for the Girl with the Sun in Her Eyes 60" x 40"
William Rose is quickly becoming one of the hottest figurative artists in the country. Coming from an IT background, Rose discovered his hidden talent one day while borrowing his daughter's sketchpad. He has been a photographer for years, so his natural eye for design and detail came to the forefront when he began to sketch some of the athlete's he coached at the time. Soon athletes' parents and friends began asking for portraits of their family members and Rose began giving more and more time to his new found craft. Once he began drawing, he moved from pencil to charcoal easily, finding the softer pigment suited his style and movements. Though hesitant to move into painting, Rose was determined to work painting into his repertoire and found that oils gave his work another dimension; and gave him the ability to loosen his style and develop as an artist. Rose chooses his materials the same way he paints and draws, with intuition. He'll pick up a brush to determine if it feels right, so sometimes this means he'll work in bristle brushes and sometimes in synthetics. In order to keep his style loose and not get carried away with details, Rose finds that sticking to flat brushes, larger than 1/4", usually 1/2" or 3/4", keep him freer. He even uses the edges and "points" of the larger flat brushes for fine lines and face details. All Down the Line 72' x 48"
With a career boost from American Artist in 2008, Rose won the cover competition for Drawing Magazine, putting him the spotlight in the art world, and drawing attention from Hollywood. He was asked to draw for a film, produced by Clint Eastwood, about a young teen prodigy drawn into the world of forgery; "Carmel" will hit theatres this summer. Rose was also approached by Strathmore, a well-known paper manufacturer and distributor, to design a cover for their 400 series drawing paper. It certainly has paid off for Rose to put his name and work out there as an artist; and it is one strong piece of advice that Rose has offered to artists -- market yourself. 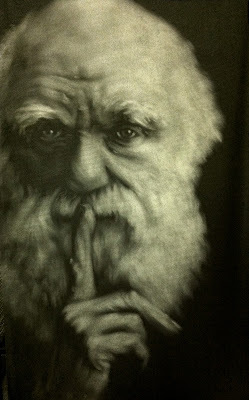 To see more of Willam Rose's work, check out his website: WilliamRoseart.com or the Artichoke Gallery. The West Wing, National Gallery of Art, Washington, D.C. The National Gallery of Art in Washington, D.C. has one of the most prestigious conservation departments in the country, with science and conservation labs for sculpture, paper, paintings, frames and the study of conservation science. In 1994, Zora Sweet Pinney and her husband Edward donated a collection of about 6000 art materials to the Conservation Department to start an Art Materials and Study Center, so that conservators and researchers could have access to samples of paint, brushes, paper, pigments, pencils and pastels, technical materials and trade literature. Since their original gift, several other large contributions have been donated, including complete lines of paint and mediums from many manufacturers, totaling more than 18,000 items in the collection. The most valuable pieces in the collection, however, are not actual art making materials, but rather the technical brochures and catalogs showing complete lines of materials. There are also contributions from significant artists, such as Richard Diebenkorn and Roy Lichtenstein with some samples from their studios, including palettes. The collection is intended for those wishing to study the materials that may no longer be available, or for which they may need to compare to modern day paints, pigments or brush types. The collection houses paints in their original tubes as well as drawn downs so that each sample is guaranteed to be viewable and test worthy for decades to come. The entire collection is housed in the West Wing of the National Gallery and cataloged digitally on a database for easy perusal. With Zora Pinney's interest in brushes, the collection includes hundreds that she donated and more being added regularly, including many from Dynasty Brush. These are housed in a large flat file, with archival foam padding and paper to protect them for years to come. Annie Strack is one of the busiest artists I've met, yet. 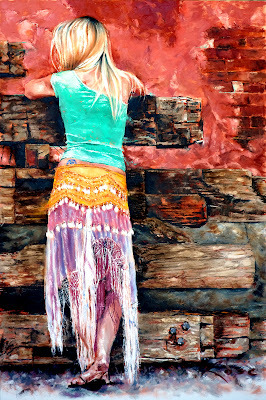 She teaches workshops, writes for national publications, stars in a TV show, travels extensively, participates regularly in the Lousiana Watercolor Society, is online working her magic and most of all, she is painting constantly. She dove head first into her full time career as an artist, and it has paid off. She began professionally painting after earning her first commission on a military base for the wife of an admiral. After twelve years of part time work and part time painting, Annie moved fully into her career as an artist, realizing that this was the time to do what she really wanted and made a full go of it. Annie's work is now featured around the country in museums and galleries; her writing for Professional Artist Magazine and her TV show, Painting Seascapes in Watercolor, keep her quite busy when she isn't painting or exhibiting her own work. 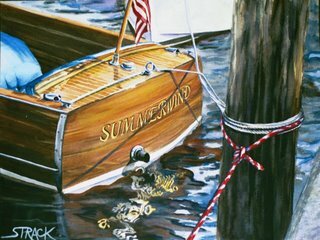 Annie also teaches regular workshops for maritime painting, architectural painting and even art marketing. Annie is a classically trained artist, raised in Naples, Florida with extensive travel in Asia, the Caribbean and the Pacific naturally leading her to create seascape and maritime paintings. Annie's coastal living has allowed her frequent access to the shore lines of the American continent, as well as contacts with the clientele that commissions boat portraits and seascapes and the occasional house portrait, too. Although Annie was trained using other media, she leans towards watercolors, considering the loose style and plein air friendliness for the type of work she creates. Whether Annie is working in larger color blocks for the beginning of a painting or the smaller details toward the end, she rarely uses a brush smaller than a 1" flat or number 12 round. Annie finds that with a good brush, she can acquire the details she needs even with the larger sizes. Synthetics, she says, also keep their bounce and spring, giving her the reliability she needs. A brush needs to hold enough pigment and fluid in order to complete a wash or "moment" in the piece without re-dipping or mixing. Synthetics, intended to mimic either Kolinskys or squirrel hair, provide her with just the right amount of spring, fluid hold and affordability. Annie believes in using the right brush, the right materials for her work and has opened the door to try new products if they come her way. Although there are always those materials that define one's work, the art material's market is constantly improving and building new supplies for making better art. A few posts back, I shared that Dynasty had introduced a new line of brushes called the Palmer. Shar Sosh was demonstrating these newbies at the NAEA convention a few weeks back and Michael's is carrying the line in many of their stores across the country, so I thought you'd like to see more about how these brushes work and what sizes and shapes are available. Jillybean Fitzhenry is a resident artist for Dynasty, having years of experience as both an artist and a material expert. In these videos, she shares the types of Palmer brushes that are available and how to use them for different textures, painting styles and projects. For loads more videos on Dynasty brushes, visit our YouTube channel. The National Art Education Association holds an annual convention every spring to bring together educators, artists and material manufacturers to develop visual arts programs in American public schools. It is a four day convention with workshops, exhibits, seminars, discussions, keynote addresses and a huge exhibition hall with the newest and best supplies available in the industry. This years show was attended by over 6300 art Educators from all over the USA. Dynasty attended the show with staff from the Glendale office as well as artist Shar Sosh to demonstrate brushes and paint with artists attending the convention. According to Jeff Mink, Vice President of Operations and Chief Innovator, "It was a great opportunity to meet the educators 'first hand' and I must say we received compliment after compliment over the integrity of the Dynasty brush products." Jeff spoke with hundreds of these artists and reinforced "our very real commitment to provide students with products that perform well and make it easy for them to achieve rewarding results. They agreed and understood that usually, the cheap poorly made brush is often the most costly, because it does not last and needs to be replaced frequently. And worse, can result in a poor experience for the student and we lose a young artist…..forever," explains Jeff. Dynasty understands how budgets are tight in this economy yet, artists and educators alike do not want poor quality for their work and their students. Getting good materials into the hands of young artists is incredibly important, because that is where art habits begin. Students will take away from their instructors the ideals on how to choose good materials and how to take care of them. At this show, Dynasty introduced the Black Bristle wave brushes for the educational market and handed out over 2000 assorted brushes. Shar Sosh demonstrated these brushes as well as the Palmers in the mannequin she was painting. She shared her techniques and invited many artists to paint along with her. Zora Sweet Pinney passed away in her home in Los Angeles on March 2nd, 2012. She was a tribute to artists and a beacon in the art material world, teaching, selling, consulting on art materials and constantly learning herself about better materials and how they are made. In particular, she loved brushes, and did extensive research on brush factories and the history of brush making, collecting hundreds of brushes along the way. When she closed her beloved art material's store in L.A., she donated the stock to the National Gallery of Art in Washington, D.C. to start a material collection that could be used for research by art conservators. Zora was always seeking to learn more about the materials artists were using and to educate artists on choosing quality materials to create long lasting art. She was a blessing to the art world, and she will be missed. 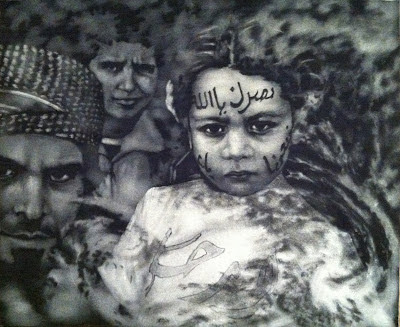 Shar Sosh, the Internationally recognized artist, has painted for Presidents, Governments and the everyday person. She was invited to paint at the U.S. Presidential Millennium Inaugural Ball as well as to paint part of the oldest, most well-known Montmarte subway station in Paris. Shar's canvas is anywhere she chooses, or anywhere her client's offer her space. Just last week, she was finishing some touches on a work on a yacht, and shortly thereafter, she attended the NAEA show in NYC and painted on a mannequin, demonstrating the Black Silver line of brushes from Dynasty. Shar has been painting for as long as she can remember. The orange X-ray paper her father used to bring home for her to use and the open encouragement from her mother led Shar's path to endless hours of painting on everything and anything. “I was fortunate that my parents were extremely supportive of me and whatever I wanted to do, and what I wanted to do was paint,” she recalls. For the nearly two decades since she finished her studies at the Art Institute of Chicago, Sosh has been busily following her muse all over the world. Even though Shar has always painted, she began working in a commercial ad agency before traveling the world sourcing art materials, designing materials, and working as a mentor to artists. She splits her painting time between America and her studio in the artist quarter in Montmartre, Paris, exhibiting and selling her art internationally. As variable as her surface and as extensive as her clientele, Shar believes that the tools make her work what it is. She has been using Dynasty brushes for 20 years and says that even to this day she carries a specific brush with her at all times and gets panicky if she can't find it. In particular, she loves the new Faux Kolinsky line, the Faux Squirrel line and the new Palmers. Palmers, she says are the work horses for artists, because they can cover all the bases for any style of art, murals, sculpture, faux work or fine art. They are easy to work with, providing a lot of control and less fatigue for the artist because of the handle design. The brushes also call to mixed media work, acrylics and anyone in need of laying in gesso or varnishing. The brushes are buoyant and springy, hold their shape, and clean easily. She explains that an artist can even make a straight line with it because of the chiseled edge. "Once you have it, you won't be able to live without it, " Shar exclaims. Taking care of one's materials is just as important as choosing the right ones for the job. Shar recommends cleaning with a mild detergent, like shampoo or dish detergent after use, or using a good quality fine art brush soap. Good cleaning will preserve a brush for years, making the investment in good quality worth the while. When Shar is not painting or traveling the world exhibiting her work and finding good materials, she can be found working with Dynasty and sharing her knowledge about good art materials. 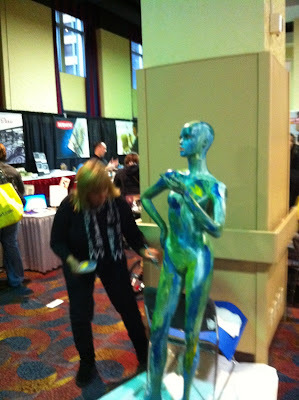 We'll touch base with Shar about the NAEA show and upcoming events. To see more of Shar's work, read her bio, purchase her work or discuss commissions, visit her website. Blick has put out quite a lot of information on brush types, hair types and choosing the right brush for the right medium. It can be a challenge with so many brushes out there to know which brush is right to use for which medium and which brushes are best for the type of painting you want to accomplish. In the above video, you can learn more about choosing the right brushes for your painting style. Dynasty has brushes for all types of mediums, painting styles and budgets. To learn more about the differences between the Dynasty brushes and the fine nuances of the Black Gold series, check out my previous post: Dynasty or Black Gold? Anna Hewett is one of those artists who has been around art her entire life, going through an undergraduate program based on the arts and knowing only painting as a source of income. She graduated with a degree in theatre design and painting from the University of North Carolina School of the Arts and has worked as a scenic artist throughout adulthood, now as the Assistant Scenic Charge for Juilliard in New York. It's no wonder that Anna's work is influenced by her knowledge of shop materials and scenic techniques, but her scene painting is duly influenced by her ability to bring life and realism to the pieces she paints for shows. With little free time, Anna is working more on her own portraits and sculptures as well as writing a blog about creating art based on current events. 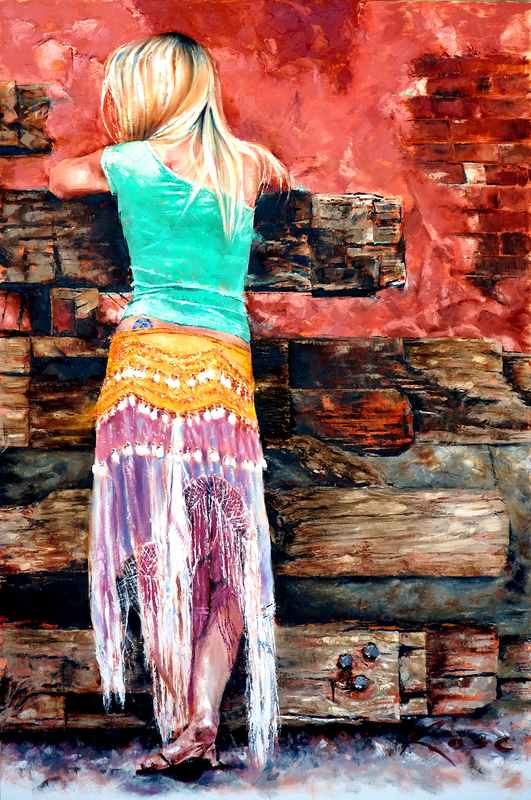 "Syrian Child", 48" x 60"
Anna's ability to adapt to her canvas and work sometimes quickly or on a low budget have enabled her to think on the fly with recylced materials including housepaints, textural compounds, adhesives, muslin, opera netting, plywood and masonite scraps. Her creativity and curiousity have taken these materials to the next level in her own art as well. Because most of Anna's work is large scale and has to be created quickly for shows, Anna works primarily in acrylics or latex with larger tools. She has taken this knowledge and style to her own portraits, using larger brushes for laying in and smaller, higher quality brushes for the detail work. She explains, too, that the brushes she uses vary in quality and not all of them are "good". Each tool has its place and sometimes and old brush is needed for building texture or preparing a surface. Since Anna's work tends to be quite large, her detailed brushes are bristle brushes, no small than 1/4" inch to get a fine line. If she needs something smaller, she leans towards flats and filberts that hold heavy body paint, like the Beau Blanc. "Charles Darwin" 92" x 52"
Anna explains that scenic painting required laying down paint quickly and efficiently and often to look as though its taken weeks to build up layers. For the larger gradients and blends she creates, Anna uses a scumble technique, known to scenic artists, that applies the paint in a figurative x-shaped motion. Expressive brushwork is another brush technique Anna uses, varying the amount of pressure on the brush to pull and push the paint, changing the width and shape of the stroke. 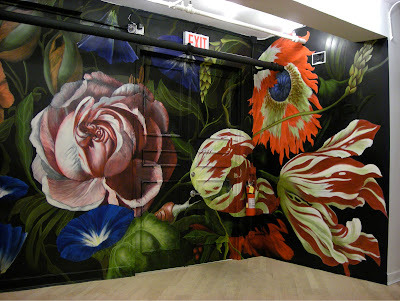 Each of these techniques gives the scenic artist an edge in making a mural or backdrop that much more dramatic, and Anna has mastered the practice. For more information on Anna's work, check out her website: Anna Hewett's website.